A soap with a story inside. 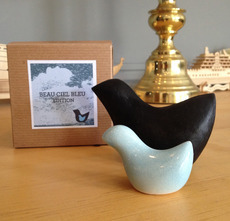 In response to the 2010 BP Oil Spill, Tippy Tippens moved from New York to New Orleans and debuted The BirdProject. 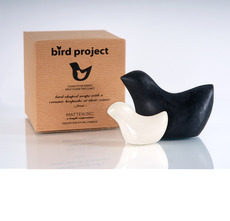 These black, handmade bird soaps made from local ingredients wash away to reveal an elegant, white ceramic keepsake inside. Healthy for the user and the planet, Tippens puts environmental recovery solutions into her customers’ hands. Bird soap sales have donated $23,000 and counting to the Gulf Restoration Network and International Bird Rescue. "No matter what we're working on, our products look to give more than they take, by giving back beyond the years of their utility and creating deeper meaning for basic objects,” says Tippens. Matter, Inc., is a social change design company based in New Orleans that unites eco- intelligence, creativity, and innovative philanthropy. A portion of all proceeds flow to causes that connect health, happiness, and sustainability. They make the world a better place by creating products and collaborations that matter. A line of glass products from up-cycled wine and beer bottles.